Stephen Fry has outlined his must-have feature for the next Apple iPhone, with the influential technophile suggesting that a projector should be built into every handset. 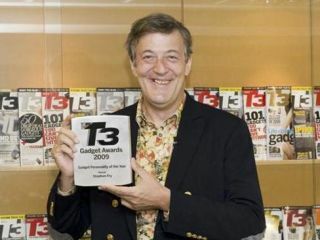 Fry, speaking to T3.com, once again outlined his admiration for Apple, despite being underwhelmed by the iPhone 3GS. "Apple has a way of undermining one's disapproval, said Fry. "I have to say when the 3GS arrived, I thought 'well I was hoping for a bit more than this'. It's fine, but it's really just a 3G souped-up. It's like one of those boy racer Fords from the 80s that had an 'S' after it. "But it's damn smart. It's almost as if they knew that the rivals were bringing out phones that were better than the year before, but on last year's chipset so wouldn't have the speed, which explains this weird concentration on 'S' for speed," he continues. "The minute you play with it and then try a rival you think 'come on!'. The iPhone has this marvelous quality where you swear at it less." So what can Apple do to wow Fry next time around? Stick a Pico projector in the device, it seems. "I'd love to see projection," he adds. "Beyond question, in a year's time, we'll be used to the sight of someone plugging their iPhone into a dock and broadcasting those beloved powerpoints, keynotes and films." Fry was talking to our fellow Future publication T3 after being nominated as Personality of the Year at the T3 Awards, and you can see more of an enlightening interview on T3.com.